We have tours that cater to the needs of the Chinese vacationers. We offer more attractions at your pace and shopping at outlet and luxurious name brand stores. We serve a Chinese breakfast most mornings when available. A goodie bag with new foods for you to try will add to your experience. We have at least one gaming destination on each tour. We stop at the post office so you can ship your purchases home. 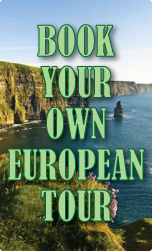 If you do not see a tour that suits you, we can customize any tour around the world that meets your needs. Bermuda departs from New York City and runs every week on Sunday until October. Ireland can be booked for more than 5 days. Disney can be booked anytime for any length of stay. Airfare is not included unless specified. Please e-mail us with your requests and we will do our best to give you the greatest vacation you ever had customized to your liking.